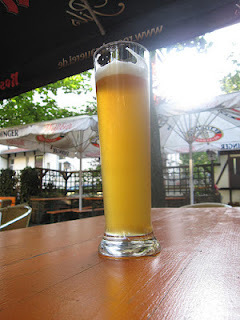 During my September 2012 road trip through Germany I made a stop in Leipizg, the historical city in Saxony where matemathician and Newton's nemesis Gottfried Leibniz was born, to check out its current beer scene and in particular to locate and taste the almost extinct beer style known as Gose. 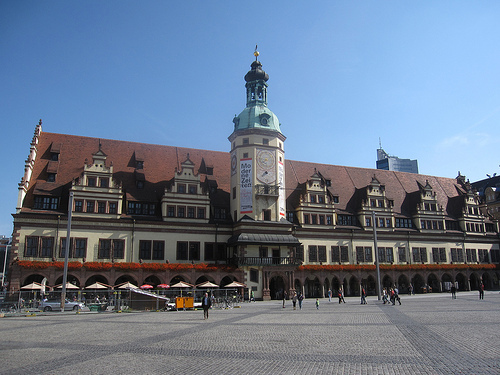 The Altes Rathaus or Old City Hall in Leipzig. You may never have heard of this style of beer before and it was a close call that few of us would have, because in the 1960s Gose went extinct! Fortunately, with the growing interest in old beer styles, the Gose has been revived and is now growing in popularity both in Germany and in America. Gose belongs to the famliy of sour wheat beers which once was brewed across much of northern Germany and the low countries (today Belgium and the Netherlands), of which Berliner Weisse and Geuze are two other remaining examples. Common among these beers were the low alcohol, usually from 3-5% abv, and high attenuation, making them dry and less sweet than many other styles. This made for a refreshing, everyday beer that could be drunk in large quantities. - the original since 1824. The style gets its name from the town of Goslar, in Lower Saxony, where it was first brewed in the early 18th century. In those early days, Gose was a spontaneously fermented beer, but when brewing science improved in the 1880s the brewers in Leipzig turned to top fermenting ale yeast and added lactic acid bacteria to recreate the sourness of the wild fermentation. Gose is brewed with at least 50% malted wheat, and because it's also brewed with coriander and cooking salt it doesn't comply with the strict Reinheitsgebot - the Bavarian purity law. But that offense was not at all uncommon in the north of Germany, where local brewing traditions held sway until the pilsner craze arrived in the mid 19th century. By the end of the 19th century, the city of Leipzig had adopted Gose as its own beer and a number of local breweries were making it. 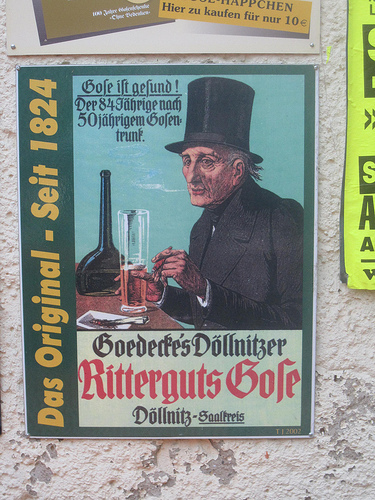 The beer was so popular that dedicated Gose bars, called Gosenschenke - "Gose tavern", appeared all over the city. 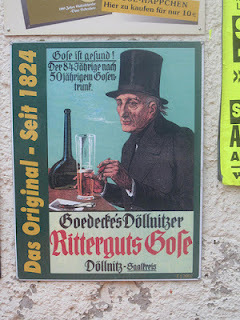 However, the popularity of Gose took a nosedive at the start of the 20th century, and at the outbreak of World War Two only one brewery - Rittergutsbrauerei Döllnitz - brewed it. When that brewery folded in 1945, one of its brewers - Friedrich Wurzler - took the Gose knowledge with him and started his own Friedrich Wurzler Brauerei. The Friedrich Wurzler Brauerei continued making Gose, even after Wurzler died, but in 1966 this last gosebrauerei closed too. The Gose had gone extinct. And it would probably have remained so, if not for the opening of the Gosenschenke Ohne Bedenken in 1986, an event I'll return to a bit later in this post. There are several places in or near Leipzig that now goes under the term Gosenschenke, selling fresh Gose from draft or in the famous long neck bottles. 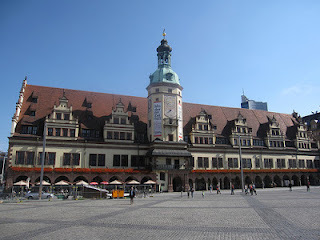 For this visit I decided to stay in Leipzig proper, which ruled out some remote places and breweries, but at least I was able to visit the place where Gose was revived as well as a proper Gosebrauerei. The old Bayerischer Bahnhof railway station in Leipzig. In the south of Leipzig, at Bayerischer platz, tourists can marvel at the beautiful portico and architecture of the oldest, preserved railway station in Germany: The Bayerischer Bahnhof or Bavaria Station. This railway station first opened up in 1842, taking passengers to Bavaria and beyond. By the 1870s more than a million passengers left from this station every year and it had several golden decades, around the turn of the century, with long distance trains stopping here to pick up passengers for Rome or Naples. However, the two world wars slowed down the long distance traveling and in 1943 the station was heavily damaged by Allied bombs. After the war, in East Germany, there was little money to restore the ruined buildings, so the station was left in disrepair. Fortunately, talk of demolishing the building never went any further and in 1975 the Bayerischer Bahnhof was declared a National Monument. Thanks to Bavarian railway enthusiasts the old portico was later reconstructed the way it had been before the war. In 1999, the owner of Schneider Bräu in Weißenburg, Thomas Schneider, made a deal with the national railway company, Deutsche Bahn, who owned the old railway building, that he would renovate and restore the building to its former glory but with the addition of a brewpub. A brewpub that would make the old Leipzig speciality, Gose. Gosebrauerei Bayerischer Bahnhof in Leipzig. After 14 months of renovations and construction, Gasthaus & Gosebraueri Bayerischer Bahnhof opened up on July 19, 2000, in the old railway building, with a modern brewhouse constructed by Kaspar Schulz in Bamberg. An adjoining biergarten was also added, allowing guests to sit outside, under shady trees, on warm summer days. During my visit, Bayerischer Bahnhof was fenced in due to construction work so I had to walk around the back and enter through the biergarten. This construction work, by the wat, has been ongoing for several years and is related to the new Leipzig City-Tunnel, which will link Bayerischer Bahnhof to the Hauptbahnhof, 2 km to the north. The biergarten was really quiet and cozy, with a couple of dozen tables in the shade of the leafy trees and a schenke which served cold beer and warm brezel (i.e. pretzels). With the railway building on one side and a quiet residential area on the other, I couldn't hear any city traffic so it felt like being in the country! The Gose poured a hazy golden color with a big, white head. It sported a mild sour fruit aroma and had a mild salty mouthfeel with a tart lemon flavor. Fairly refreshing and good. Other than the Gose I only tried the schwarzbier, which combined a good roasted malt character and dark chocolate really well. I wouldn't mind spending more afternoons here, with a cold Gose and a fresh Brezel. Ohne Bedenken, which means "without concern", has played an important role in the revival of Gose and the history of this Gose tavern goes back to the heydays of Gose. In 1899 the Cajeri family moved to Gohlis, back then a little village just north of Leipzig, in Hauptstraße 38 (now Menckestr 5 in Leipzig). Here they opened the Gosenschenke Ohne Bedenken. A few years later, in 1905, a large biergarten was added too. Gosenschenke Ohne Bedenken stayed in business, under several different owners, until the dark days of World War Two. In 1943, the biergarten and the houses surrounding it was completely destroyed by Allied bombs, and after the war the place struggled to stay afloat until it closed without a notice in 1958. 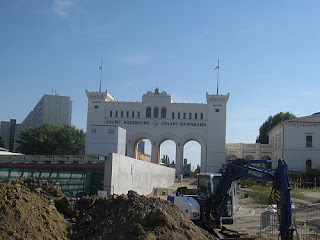 Eight years later, the last Gosebrauerei in Leipzig and the world closed down. The Gose tradition of Leipzig was gone. - where Gose was revived. For twenty years nobody drank Gose or hardly talked about it, until one Lothar Goldhahn bought the old property of Ohne Bedenken and decided to renovate the Gosenschenke. Naturally, he wanted to make it as authentic as possible, which meant serving Gose. But where could he get that? Goldhahn talked to several old timers, who still remembered how the beer had looked and tasted, to piece together an idea of what the Gose had been like. He then asked several local breweries if they would like to brew this beer for Ohne Bedenken, but none of them dared to brew the strange beer. 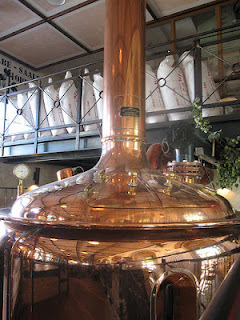 In the end Goldhahn managed to convince Schultheiss Berliner-Weisse Brauerei in Berlin to brew Gose for him. 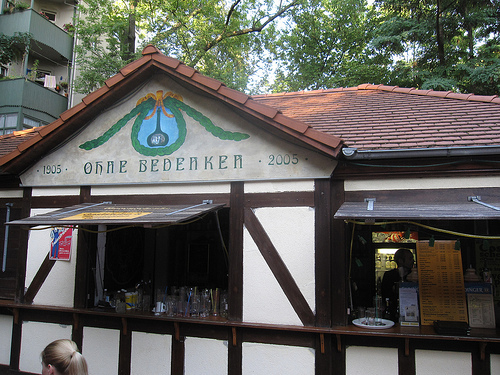 In 1986, Gosenschenke Ohne Bedenken re-opened and could proudly serve Gose to its guests. In 1990, the current owner Dr. Hartmut Hennebach bought the Gosenschenke and has faithfully maintained it ever since, helping to spread the gospel of Gose and revive an almost lost beer style. Today, Ohne Bedenken has a thriving biergarten where locals as well as beer turists can sit down under shady trees and enjoy a fresh Gose from draft. During my visit, the Gose on draft was the Original Leipziger made by Gosebrauerei Bayerischer Bahnhof, which I had already tasted at the brewpub, so that was a bit disappointing. The only other Gose available was a bottled version called Original Ritterguts Gose, which was actually very good - more salty and sour than the one from Bayerischer Bahnhof. In addition to Ohne Bedenken and the Bayerischer Bahnhof I also tried out Brauhaus an der Thomaskirche, mainly because of its central location in old town Leipzig. 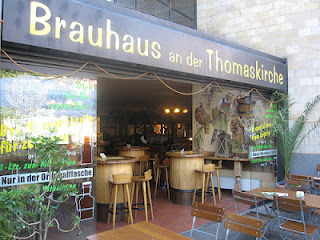 Located on the square by the St Thomas Church, this brewpub offers regular German lager beers but no Gose. Even though the pub seemed a bit touristy I thought the beer menu looked decent, as they offered both an unfiltered (naturtrüb) pilsner and a bockbier on draft, so I sat down for lunch. The Thomaskirche Pils poured a hazy, golden color with a large white head. It smelled of fresh grass and had a light mouthfeel with a very lively carbonation. It had a nice malt character with a mild floral hop flavor, but the strong carbonation probably hid some of the taste. Still a pretty tasty pilsner. The Bockbier also turned out to be highly carbonated, with an almost acidic bite to it, but I still got some ripe fruit notes and sweet caramel in the flavor, so it seems to be a good bockbier. Overall, I found the Thomaskirche beers good, but a little less carbonation would have brought out more of the subtle malt and hop flavors and caused a better review from me. The Brauhaus an der Thomaskirche in Leipzig makes no Gose. More photos from my visit to Leipzig can be found in this Flickr set. Strange timing, though, since Hartmuth Hennebach died last Friday. He's been ill for some months. I guess that might be why they only had Bayrischer Bahnhof gose on draft. I've been to Ohne Bedenken many, many times and they've always had their own gose on draft. Strange timing, indeed. I'm sorry to hear that Dr Hennebach has passed away, he was a great ambassdor for Gose. I hope the new owners will continue his work and maintain Ohne Bedenken as a Gosenschenke. Beer Mat Hunter – the web search engine that helps you find beer mat collectors and their collections on the World Wide Web.